Was it almond milk that Cleopatra used to bath in? If it was I don’t blame her. The stuff is just wonderful. I have been making all kinds of things with it. Rice pudding, porridge, lattes and now smoothies. Our smoothie drinking has unfortunately been somewhat curtailed by the blender on my ancient food processor breaking down, but despite that I have a great recipe to share. The mention of smoothies tend to go down with a bit of a groan in this house. It’s not that people don’t like them, but when you live in a house full of blokes, this type of drink having a girly reputation, seems to invoke much macho scoffing. I am relatively thick-skinned and choose to ignore most of this. Also the arrival of ‘vintage paper straws’ seems to sweeten the deal and happily this pastel-coloured creamy delight has been slipping down a treat. 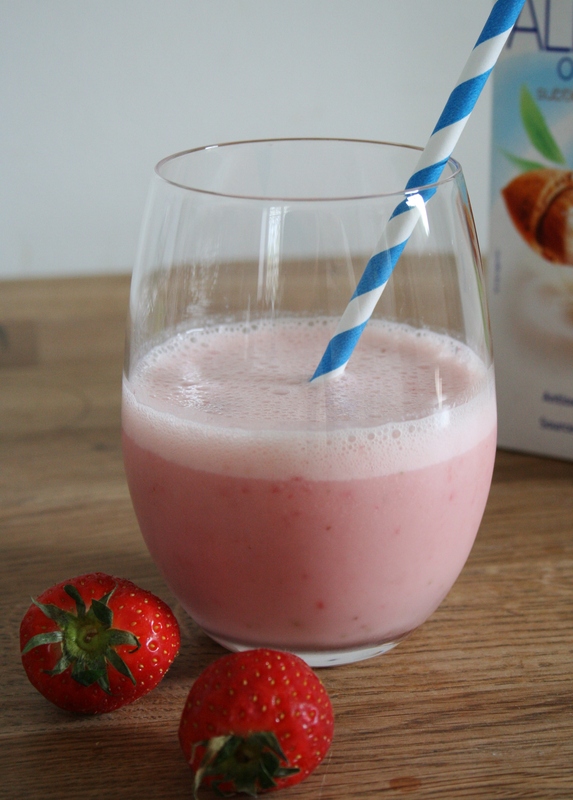 300ml Almond Milk, 1 Banana, about 5 Strawberries, a working blender, 4 ice cubes. Pop everything into the blender and blend until smooth, although the odd lingering lump of ice-cube will be fine. Pour into suitable glass and enjoy with breakfast or as an after school fill you up. Almond Milk: I buy it in Sainsburys, so unlike Coconut Water, it is readily available in the section with the longlife milk, milk powder and longlife soya milk. It has a natural very slightly sweet taste and in coffee imparts a flavour not dissimilar to using one of those syrups. To my mind this is infinitely more pleasing than the soya milk alternatives to milk. I also understand (although don’t quote me on this) that it is anti-allergenic so even better for you soya milk (to which some are allergic). Iced Tea seems very English but is in fact fairly hard to come by here in the UK. I believe this is something of a tragedy, as if you want a lovely long non-alcoholic refreshing drink which isn’t too sweet, the choices seem to be limited. Possibly because we rarely have suitably hot weather, we don’t seem to cultivate such drinks and the ‘tea council’ or some such body like to propagate the notion that hot tea will cool you down on a hot day anyway! Whilst this may be theoretically true, I’ve never found it helpful in this regard. 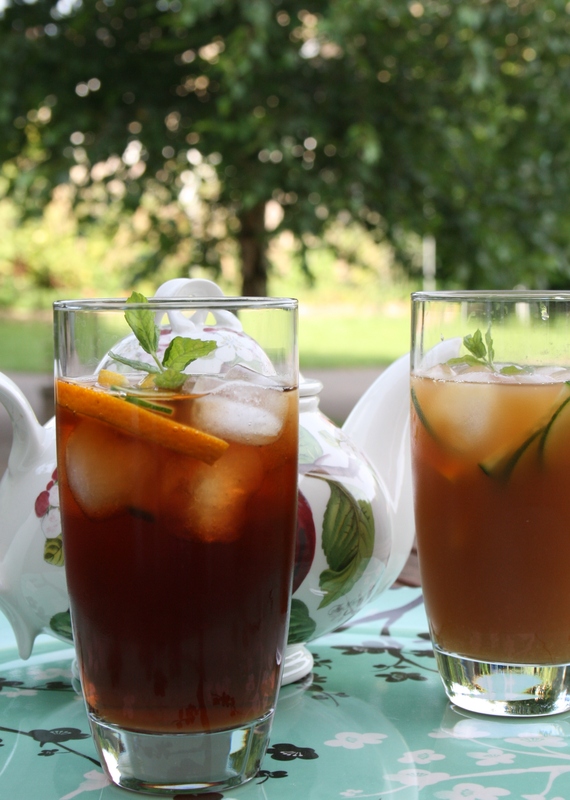 So here are a couple of suggestions for Iced Tea with a bit of a twist. Try and get hold of some Lady Grey tea bags. Twinnings supply it and it is readily available in supermarkets. Ideally the day before make a pot with about 3 tea bags and 800ml of boiled water in a teapot for preference or if not a large jug. After 5 minutes or so pour the tea into a large jug if not there already or remove the tea bags from the jug and leave to cool down and then chill in the fridge. To make a hi-ball sized glass of tea you will need per glass: about 6 ice cubes, a quarter of the tea (200ml or so), 1 -2 tsp sugar, 100ml orange juice or cold water, a slice each of orange, lemon and cucumber cut in half and a sprig of mint. Combine, stir and sit back and sip. 800ml of tea should provide enough for 4 glasses. Lady Grey has a lovely citrus-y flavour, enhanced by the orange slices if not by the orange juice and a very low tannin content which is desirable with iced tea I feel. The sugar quantities can be adjusted to taste. 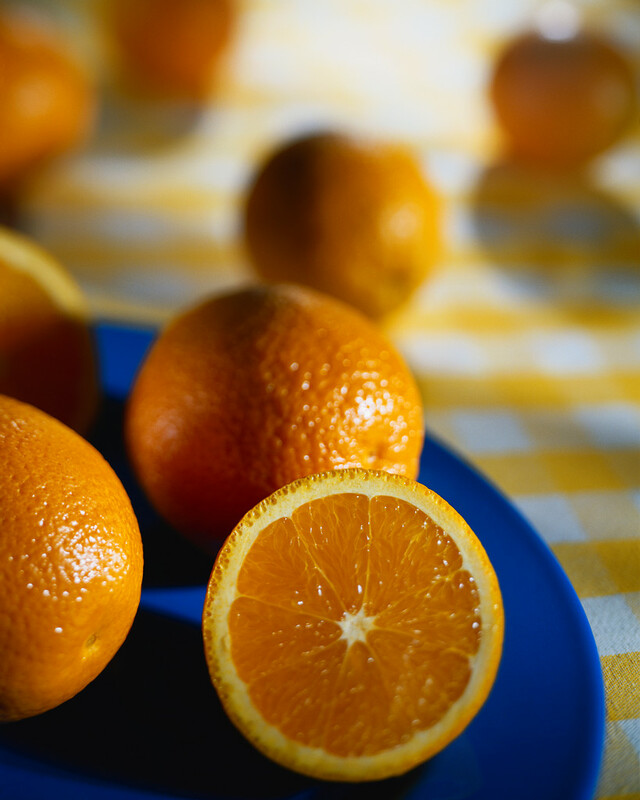 I’m not quite sure when I took my eye off the ball, orange in fact, but we seem to have rather a lot of them glowing up at me from the fruit bowl. I’m a little bit scared to go out to the shed where we keep the overflow from the veg/fruit delivery at this time of year as the last time I was out there struggling to get bikes out or tumble drying done I think I saw a few more lurking. We really like orange flavour in our house; squash, juice, lollies, sweets, chocolate, ice-cream, cake, marmalade, duck (!) you name it we’ll happily eat it. But not so much if peeling and faffing with the pith is required. The kids seriously can’t be bothered with it, my better half similarly has an aversion to this (clearly patience for peeling oranges is a genetic issue) and I consequently do not have the time, inclination or finger nails to perform this task on everyone’s behalf! I do have a standard, slightly dinner party-ish, ‘Oranges Steeped in Brandy Syrup’ dessert which I usually make at such moments (that would use up about 4), except I don’t have a dinner party planned and quite frankly this would be a pip in the crate, so to speak. Cakes generally would use 2 at a push, Delia’s famous Chicken Basque only needs a half! Juicing I think is the only option here and as it’s Friday…. oooh I’m warming to my theme…I think the cocktail hour might be upon us (come 6 o’clock anyway). Yes definitely! The situation is so bad juicing and adding to alcohol/or not as the case may be, is the only solution. Excellent. What shall I make then. I hardly ever have cocktails. Luckily I have been chatting with the very talented scarpetta dolcetto who’s blog here at wordpress.com jumped out at me from the aptly named Freshly Pressed page. I’m a sucker for anything Italian sounding and so I just had to have a look. She has a fab picture up of a grapefruit/vodka concoction and when I investigated further she reminded me of all the orange juice cocktail options I have. So we are switching our more usual Friday night tipple from wine to Wallbangers, or something similar. So to ‘fess up for a moment we actually did this last Friday to celebrate the end of Half Term. I had 15 oranges dotted about the place which I juiced. 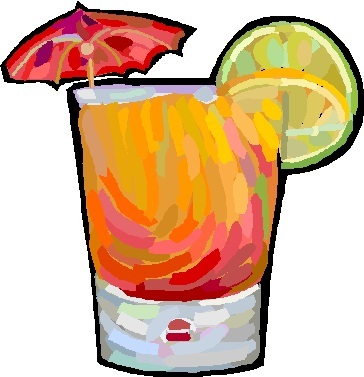 This supplied enough liquid for 4 drinks as follows: Pour a shot of vodka over crushed ice in a hi-ball, then fill up to about the 1/3 point with cranberry juice, and up to the top with the orange juice, squeeze a couple of teaspoons of lime juice into this mixture and stir. I don’t like things too sweet and neither did my companions so we found this to be perfect. I also tried one without the vodka, and that was delicious too. I seem to remember, from a trip to TGI-Fridays or some such place, the non-alcoholic version can be topped up further with sparkling water for a really long drink. All very enlightening. Grazie scarpetta ♥. P.S. A shout out to office.microsoft.com for this cocktail picture. Free artwork, photos and more to download and use, and just how perfectly identical to my cocktail, slice of lime and all! P.S.S. You may or may not have noticed the new Top Page – Recipes:No Chat. This is all the original recipes without all the crap chat. It’s a bit more concise and should lend itself to printing off better too.